Creating powerful and moving fundraising experiences. SAWW events deepen education and connection with the story behind the event. Imparting respect for the women whose story it is. Sharing under-standing and wisdom learned from their experience. 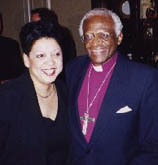 With the grace of prominent guest speakers, such as Archbishop Desmond Tutu, SAWW fundraising events can eclipse into transform-ative experiences, generating great benefit for the projects in focus. And providing highlight moments for the supporting contributors. There are opportunities for first class fundraising and meaningful sponsorship. If you, or your organization, would be a valuable partner with SAWW get in touch! Phelophepa Health Train and The University of the Western Cape are two organisations that have benefitted from SAWW fundraisers, for details,pleaseclick on the links above. For more information on our events management and co-ordination please click on the Adriaans & Associates link above.